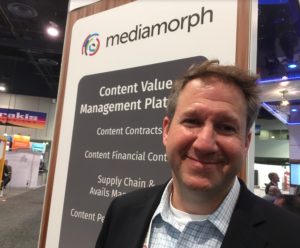 LAS VEGAS — Mediamorph continues to make major strides in the U.S. and other markets, Rob Gardos, the cloud-based content value management (CVM) specialist’s CEO, told the Media & Entertainment Services Alliance (MESA) at NAB, where the company spotlighted a new solution for direct-to-consumer (DTC) platforms. Gardos highlighted the three main areas that Mediamorph’s new solution is supporting its customers with: Consumption tracking, managing the supply chain and dealing with transfer fees. The new solution leverages the power of Mediamorph’s CVM platform and was designed to “help drive increased revenues while minimizing risk as content providers embark on their DTC journey to directly capture and capitalize on the connected consumer,” the company said in announcing it April 8. The new approach “streamlines and automates DTC end-to-end content and financial workflows and is built upon proven Mediamorph CVM technology,” the company said. That includes: Content Ecosystem & Supply Chain Management that automates and centrally controls DTC internal content flows to handle massive variability in storefront platforms and territories while managing rights across DTC and non-DTC platforms; Content Portfolio Management that provides an inventory of historical content performance in one centralized location to better understand what content will work best for an organization’s DTC platform and which should continue to be licensed to third parties; and Intercompany Content Settlements that provides visibility into content revenue by creating a transfer pricing system that will bring clarity to stakeholders and transparency to participants to ensure content on DTC platforms is being accounted for openly and fairly, according to Mediamorph. Providing further insight into the new solution at NAB, Gardos stressed how important it is today for digital video service providers to understand how subscribers are consuming content and what type of content they want to continue consuming – “things that Netflix, quite frankly for the last decade, has gotten very good at,” he said. Although there’s some “top-tier content that will attract users,” not all content is like that and it’s important for any new provider of a DTC offering to “become more consumer-centric and more content-centric” to take advantage of the growth in the binge-watching of a broad range of content, he explained. Because Mediamorph supports “nearly 70 percent of all” electronic sell through (EST) and transactional video on demand (TVOD) “transactions that take place” across the industry, “we have a giant ingestion engine that we bring all this data [into], track it all [and] enable you to do analytics around how end consumers are consuming content,” he noted. All of the companies that are providing content on a DTC basis “have to come to terms with the fact that they’re a retailer,” and they face “a huge deal of complexity around” figuring out how to get their content to consumers, he said. One major issue is that an organization’s play-out system to deliver content may be new today, but “will be legacy tomorrow,” so they need to “partner with a broader ecosystem” to achieve success by making content available to a broader number of devices and platforms, he noted. DTC service providers also face “complexities” with handling content metadata that include technological limitations such as whether a device can handle 4K resolution or not, he said. Mediamorph has seen “huge growth on the retail side of the value chain and huge growth within our existing, established relationships on the content side,” Gardos said, adding: “Every major studio uses our product. We’ve got nearly every major broadcaster [and] we have the two largest” multiple-system operators (MSOs). Mediamorph, meanwhile, is seeing “huge growth in Europe,” Gardos told MESA. A deal with another multinational telecommunications company was just completed by the company, he disclosed, but said it was too soon to identify it. Major telcos like this have evolving technologies, have 70 million customers and are “redefining themselves as a video distribution platform as 5G evolves,” he said, noting these firms are “in the perfect position” to capitalize because they already have large audiences viewing content on multiple devices. Although “everyone keeps talking about the supply chain collapsing,” what’s actually happening is “the players are just shifting,” he said. The company now also stands to make strides in Austria through the deal it just signed with the Austrian division of T-Mobile, which selected Mediamorph to streamline its VOD business, to better capitalize on content contracts and VOD royalties, streamline asset orders, and get a better view of its content ecosystem and supply chain management, according to Mediamorph. AVS has been “building some of the biggest podcasting studios” in the U.S. and “we’re one of the largest builders” of those studios, he said, adding the growth in that sector is being reflected on the NAB show floor this week. “Ways to transport that video around an office [and] around a studio” and the development of “that whole workflow” are issues many organizations are interested in, he said. Another major area of focus for AVS now is render farms and helping organizations develop workflows around visual effects and editing around rendering, he said, noting that’s something his company is also spotlighting at NAB. “There’s a big discussion” in the industry “around whether or not cloud rendering” or on-premises rendering offer the best solutions, he said, noting: “We’ve done some extensive research on that and we’ve developed some really good data on the fact that, still, on-premise is the better way” to render. One major reason for that is the much greater amount of time that’s required to send high-resolution video off premises today via cloud services becomes “counter-productive” for organizations, he said. 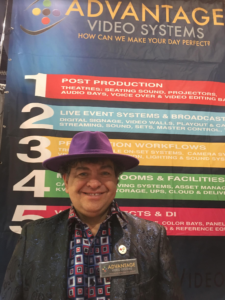 At NAB this week, Caringo is focusing on “the fact that you can deliver content from the archive layer,” Adrian Herrera, the company’s VP of marketing, told MESA April 9 at the show. Although Caringo has been in business 13 years, in the media and entertainment sector, “we just started really having a presence four years ago,” he said, noting this new archive layer it’s focused on is “needed” because it “enables on-demand workflows” in that it allows users to “instantly recall project files” and supports the infrastructure required for over-the-top (OTT) and other on-demand video services that are growing so significantly. The company is spotlighting at the show how its content-focused storage platform Swarm provides organizations secure access, distribution and long-term retention. With both S3 and NFS access to the same content, Swarm protects files at exabyte scale and enables streaming and longtail video-on-demand, centralized backup, distribution for collaboration and tape replacement, according to Caringo. 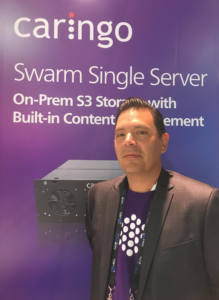 Since last year’s NAB, Caringo also introduced a simple way for organizations to get started using Swarm by offering it on the Swarm Single Server Appliance – a new solution being demonstrated by the company this week that was designed to meet the needs of small- to medium-sized content-driven organizations, Herrera pointed out.